I know thematic units are not popular with the Untargeted CI folks, but it’s working for us in our district. La comida is just so fun to teach to my Spanish 1s! 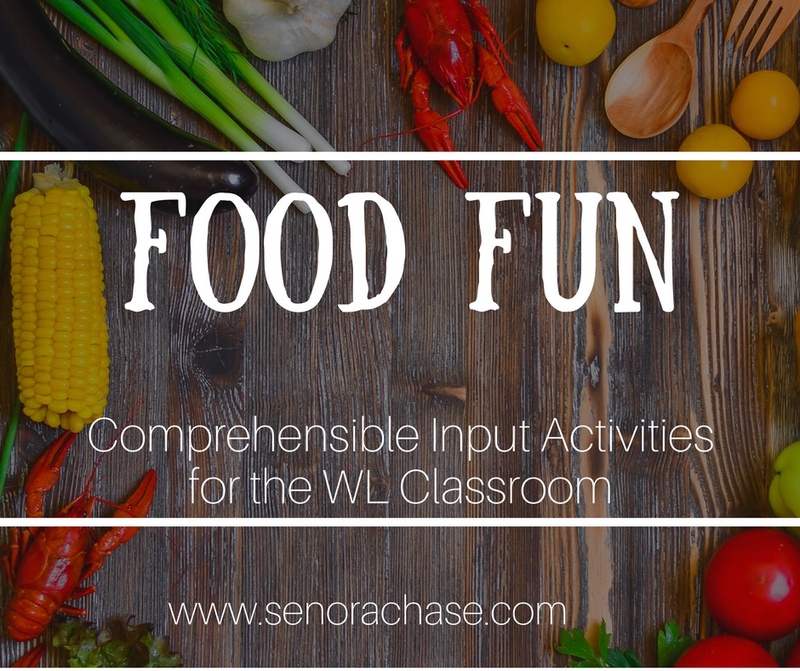 Below are some food resources I’ve created to teach La comida using Comprehensible Input. Food Fight: I always begin the unit with a food fight, which goes back to the good old days of TPR (Total Physical Response).All you need is a selection of fake food (Fruits and veggies work particularly well) and a captive audience. Put 10-12 food items in a brown paper bag (to conceal the contents) and take out one. Write the word and its translation on the board and ask as many questions about it as you can in the target language. You know the drill: Apple. Who likes apples? Do you like red apples or green apples more? Who likes apple juice? Who doesn’t like apple juice? Class, do you know what I like? I love apples covered in caramel! Who else loves apples with caramel? Then throw the apple to a student. Class, who has the apple? Jonathan has the apple. Jonathan, throw the apple to Shelby. Jonathan throws the apple to Shelby. Class, what does Shelby have? Yes, Shelby, has the apple. Shelby, please throw the apple to Cam. Apple soars from one corner of the room to the other. Class, does Shelby or Cam have the apple? Cam has the apple, Shelby had the apple. Then introduce another fruit. Talk about it, ask questions about it, then throw it to another student and repeat. But this time, you give commands regarding the apple and the orange. Throw the orange to Maggie. Throw the apple to Joe. Which student has the orange? Joe, throw the apple to a tall girl. Maggie, throw the orange to a boy who has black hair. Play around with that for a bit, then introduce a third food. Of course everyone is paying attention because no one wants to get pegged in the head by a plastic banana. (And sometimes a kid gets pegged in the head by a plastic banana. It’s OK, I haven’t lost a student during Food Fight in 12 years. And the riskyness of flying foods make it really fun.) Then introduce another, and another. My kids from last year still reminiscence…remember that time when we threw food at each other…. Mr. Bean MovieTalk: I like the movie clip of Mr. Bean at a restaurant for a MovieTalk. We do the first 4 minutes one day and finish the movie clip the following day. Here is a reading that goes along with the clip. You could also make a MovieTalk Jumble with screenshots, but I haven’t done it yet! Robin Hood Restaurant: I heard a great story on NPR about a restaurant in Spain that serves regular breakfast and lunch but turns into a Soup Kitchen for dinner. I thought it would go perfectly with this unit, so I typed up a reading. Here’s a nice video clip showing the restaurants that might be nice to show students and here’s another that’s a news clip– it certainly won’t be totally understood but I think they’ll understand a lot after discussing the reading.